Periodontal disease, known more commonly as gum disease, is a chronic disease estimated to affect nearly two thirds of all Americans at some point in their lifetime. Gum disease is an entirely different process than dental decay (frequently called cavities). In periodontal disease, the gums and bone holding in the teeth are slowly destroyed, leading to loose teeth and ultimately tooth loss. At our dental practice in Orange, CT, Drs. Nicholas and Carla Calcaterra have extensive experience in the diagnosis and treatment of gum disease to prevent tooth loss. Poor Oral Hygiene: patients who do not brush and floss regularly end up with more debris on and between the teeth. This leads to irritation of the gums. This is the most important contributor to gum disease. Infrequent Dental Visits: individuals who do not receive routine dental care accumulate more plaque which leads to more gum problems. Smoking: tobacco smoking is not only bad for your lungs but it will make your periodontal disease much worse. 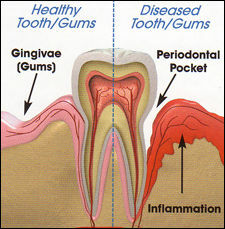 Diabetes: both Type I and Type II diabetics are more likely to have gum disease. And when it is present, the diabetes makes the disease worse. Other Medical Conditions: numerous other medical conditions can contribute to gum disease. Genetics: unfortunately, your genetics can make you much more likely (or less likely) to develop gum disease. Regular bleeding while brushing or flossing. Receding gums so that your teeth look longer (which is where the term “long in the tooth” originated). A change in the fit of your dentures. 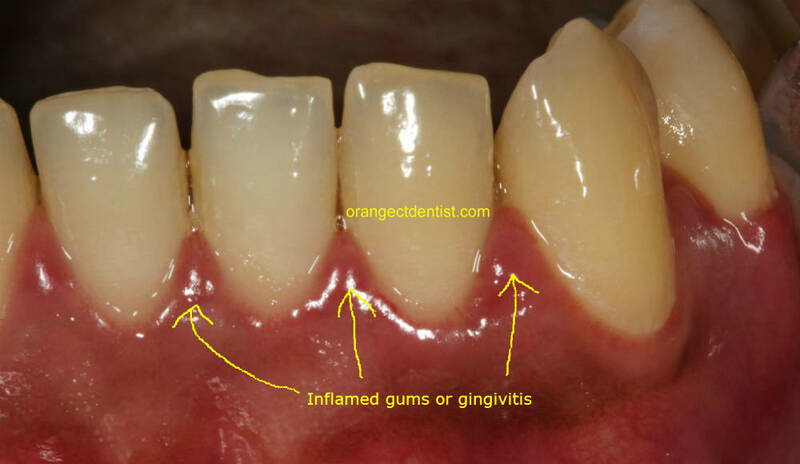 Early stage gum disease is called gingivitis. 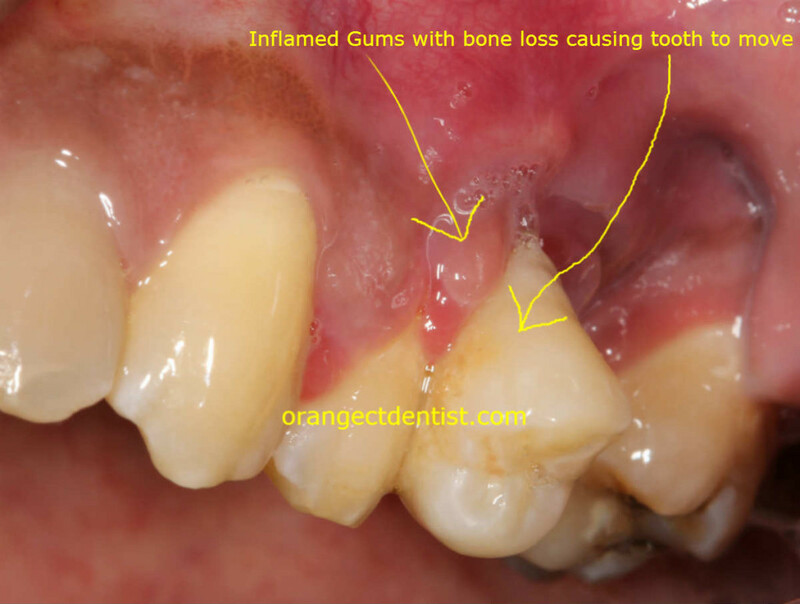 In gingivitis, there is inflammation and bleeding of the gums, but there is no permanent destruction of the bone and gum tissue… yet. Although some cases of gingivitis will remain as gingivitis only, most cases, if not treated properly, will progress to periodontitis. The photo on the right shows a patient from West Haven, CT with generalized gingivitis. She sought treatment at our office. Had she not received treatment, she likely would have developed periodontitis which could have led to tooth loss. Most cases of gingivitis are diagnosed by us and treated by a regular dental cleaning. Patient from Milford, CT with advanced gum disease. Photo Dr. Nicholas Calcaterra. The photo to the right shows a patient who came to us from Milford, CT. He had not been to the dentist in approximately 5 years. Based upon our exam and x-rays, he had periodontitis. Nearly all cases of periodontitis are treated with a procedure called Scaling and Root Planing or often referred to as a “Deep Cleaning.” In this procedure, we numb the patient similar to what we do for fillings. But we numb one entire side of the mouth. Then, we gently clean the plaque and tartar that has accumulated under the gums. This takes much longer because of the amount of debris under the gums. We then repeat the process a couple of weeks later on the other side. Alongside scaling, we will often place a local antibiotic into the gum pockets. We also will often prescribe a special mouth rinse containing Chlorhexidine. After the scaling and the antibiotics, the periodontitis is usually stopped. We then see the patient for regular cleanings on a much more frequent basis – usually every 3 to 4 months. This is called periodontal maintenance. If you have any of the above symptoms, call our office at (203) 799 – 2929 or visit our appointment request page.